The light was cheap and found it in the discount bin at my LFS. This wavepoint was from my first pico tank which has now been upgraded with an AI prime HD. No comparison obviously. Few gripes of the wavepoint light: -It is very blue and have a real hard time getting good photos even with Androids "nightsight" picture feature. -Has no adjustment, and no power switch (I spliced an inline switch) or a light timer could be used. -The mount is a bit janky... I have experienced no light dives due to mounting. However it's a pita to adjust because of how tight you have to screw the mount knobs combined with salt buildup. HOWEVER, the wavepoint light did make my gsp, zoas, and blastomussa VERY HAPPY in comparison to the AI prime. Could be used error on my behalf. Current light settings. QUESTION: Should I be concerned about in tank proximity of the Xenia, and the Clove polyps? Read up a bit on a few stories, and have to get conclusive answer Came home to much healthier looking coral as compared to this morning. Survived my dip, and continuous turkey baster blastings. The Cloves had quite a bit of detritus built-up on the frag base and stems. I didn't. I failed twice, then picked up a rimless bow front tank that measures 11.8" x 8.9" x 8" I was going to try again, but the 7 pet supply/LFS stores in my area were SOLD OUT with no eta on restocking. I took it as a sign, and bowed out for a few days giving up. Til I shared my glass shattering frustrations with a buddy that gifted me my current tank. 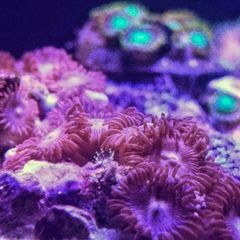 First off would like to Express my gratitude to the community for the plethora of information and support available here on Nano reef. I have always been an authusiast of aquaria keeping but never had the passion for the hobby until I joined here and started my first pico reef. So thank you all. If this cannot be entered for the 2.5 oldschool challenge tell me. Last month I started a new tank in spirit of the 2.5 gallon old school challenge. My wife has fallen in love with the hobby and has become the primary care giver to our current pico, she wants another for our counterop. I must admit it didn't start well, and I nearly gave up..... feeling I was cursed. I went to petsmart planning on going as simple as possible. Picked out a 2.5gal. $14.99 special, and a HOB 30 aquaclear $21.00 for a refugium liverock sump/filter. Got a media bag, and a small hunk of live rock from the LFS. Ran by Micheals craft store for yarn design mesh board (filter), and picked out a small piece of scrap plexiglas from Ace hardware. Got it all home and began working on the filter first. Gutted it, and added my own filter walls using a; scribe, dremel, and drill. Applied safe silicone (dap) to hold the walls in place. Trying to replicate refugium flow as best as possible. Placed the media bag full of live rock in the sump then made a filter floss hopper out of the mesh purchased from Michaels. Got it done, tested it and it worked quite well. WIN! Next on the agenda was the easy part, stripping the unsightly top rim off of the tank. As a master mechanic by trade I thought "PIECE OF CAKE" I brought home a hand full of blades and scrapers to quickly dispatch that plastic rim. Nope... I was very patient and watched a few videos even. It was nearly off and one side slipped up before the majority. CRACK! So my wife picked up another tetra branded 2.5g. tank. As this is to be her tank after all. It was LOADED with silicone. I was even more patient the second time using silicone spray to lubricate the 1/8" glass while I released it. CRACK! Same thing. I walked away in defeat. After trying to repair with bandaids and super glue I water tested it for the first time. Yeah, it failed.... And nearly gave up on the project. The next day I had a friend offer me a JBJ picotope tank and I gladly accepted. And I came home motivated again. Began to fill it with live sand and molded a scape with Caribsea life rock rubble. Think I created a monster with the complexity of it all, but only time will tell at this point. 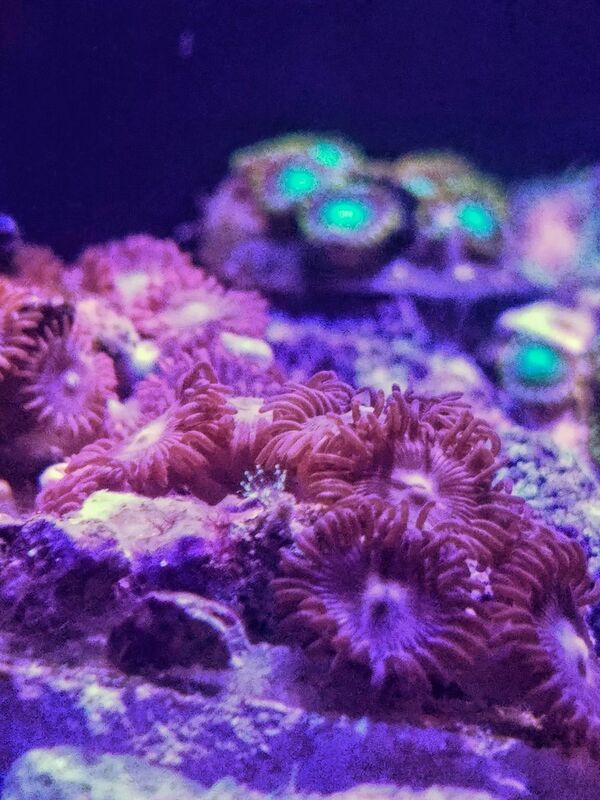 The coral the wife has been looking at are zenias, polyps, gsp. Really anything that sways and is low light high nitrate tolerant. So please share suggestions. Will be running a wave point 8w. With plans to upgrade in the future. Thanks again nano reef!